Adorable lil Bunnies in beautiful soft colors using micas to color, scented pleasantly in essential oils, but never overpowering. 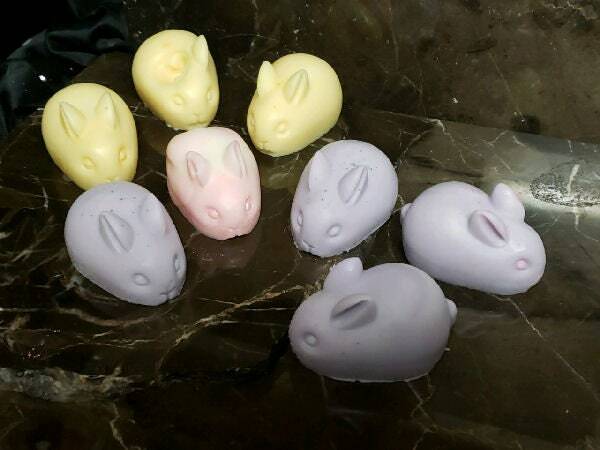 We present to you Bunnies in Goats Milk Soaps. Perfect for baby Shower Favors, birthday parties, wedding showers, ro any event you can think of. We offer a wide verity of colors and scents from our drop down menu and see optional packing if you do not prefer the standard packing. Standard packing is bunny in cello pouch on nesting shave and tied off with iridescent ribbon or natural ribbon. Your Bunnies are made to Order and would be ready to ship within 4 business days of your completed order, A convo will be sent at time of your order to go over ribbon and nesting, or if optional Box is used, and special tags. We love special orders and want your event to be a happy one, if there is a quantity, color, scent, added ingredient, or special enhancements Send Me a convo, We are Happy to create.